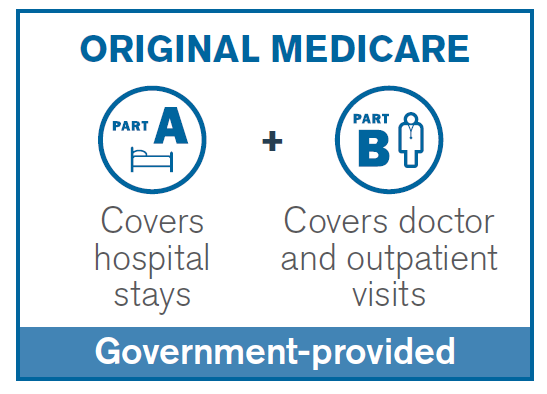 Original Medicare, also known as Part A and Part B, is managed by the federal government and provides Medicare eligible individuals with coverage for and access to doctors, hospitals, or other health care providers who accept Medicare. Part A includes hospital coverage, as well as some short term post-hospital care. Part A does not cover long-term care. Part B is your medical insurance, including doctors visits, laboratory testing, and some preventative care. Part A and Part B do not include certain services, such as dental services. In addition, they do not cover Prescription drug plans. If you are on Original Medicare, you will need to sign up for a Part D plan in order to receive prescription drug coverage. Original Medicare is a fee-for-service plan, meaning that the person with Medicare usually pays a fee for each service. Medicare pays its share of an approved amount up to certain limits, and the person with Medicare pays the rest. Most beneficiaries will pay nothing for Medicare Part A. We all pay taxes during our working years that are specifically for our future healthcare coverage during retirement. These taxes go to offset the cost of Part A later on. As long as you have worked for 10 years (40 quarters) in your lifetime in the United States, you will generally pay nothing at all for Part A. If you or your spouse have not worked 10 years in the U.S., the monthly premium for part A is up to $413/month in 2017. People with less than 40 quarters work experience but more than 30 quarters can get a pro-rated premium. The majority of Americans will pay the standard monthly amount set by the government. In 2017, this is $104.90/month for most people, but is $134 for people new to Medicare. However, you may owe more if your income is above a certain level. If you enroll late into Part B, you may also have to pay a penalty for life. It’s important not to miss your enrollment window whenever you retire and lose access to your employer group health insurance. As mentioned previously, the costs of Part A and B can be high, and they provide limited coverage. In addition, there is no out-of-pocket maximum for Original Medicare. This is the most you have to pay for covered services in a plan year. After you spend this amount on deductibles, copayments, and coinsurance, your health plan pays 100% of the costs of covered benefits. Because their is no out-of-pocket maximum, there is no limit to what you will spend out of pocket for your health coverage. Furthermore, no Prescription Drug Plan is included in Parts A and B of Medicare. There are two main ways in which you can protect yourself against catastrophic medical spending. Medicare supplements are available for purchase to cover the parts that A & B don’t. If you need a more affordable option, Medicare Advantage plans are a great option to get your A & B benefits through a private health insurance plan at very little cost. Medicare Advantage Plans often include drug coverage as well.